Many people, when they’re buying a customized pool or adding on a spa to their backyard, don’t realize that there are so many great water features they can add to their yard to accentuate its beauty. 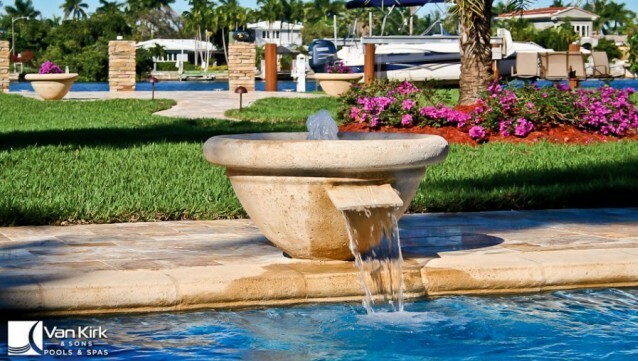 This article is meant to help you understand what these water features can do for your yard, and the best ways to implement them. A water feature can add beauty to your patio, but it can also add sound and atmosphere to make your backyard a peaceful oasis of tranquility. Of course, if you have an idea of another type of water featured you’d like to have in your new pool or deck area, let us know and we’ll accommodate! 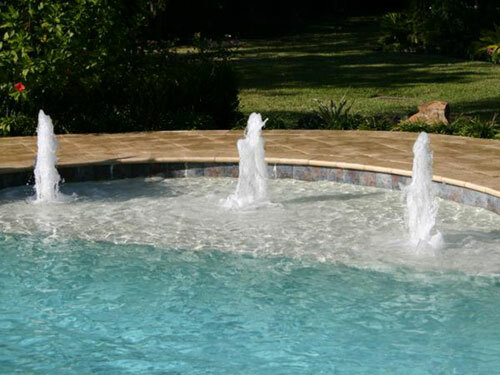 There are different variations of each of these water features, so let us know what style fits you and your home. 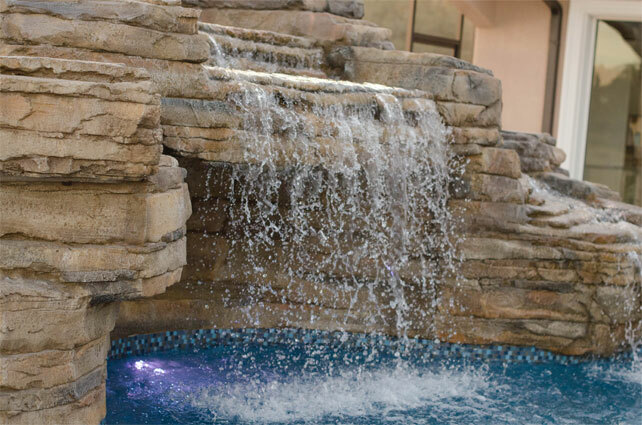 These are essentially cascading waterfalls pouring into your pool. Not only are they visually pleasant and fun to swim under, but the peaceful sound of the rushing water is beautiful white noise to have in the background of your patio. This is basically a type of waterfalls, with all the water coming out in one beautiful sheet of water. Water bubbles up from your pool in a nice, peaceful fashion, like a small geyser. Add to the beauty of your pool at night with LED color light bubblers underneath bubblers, waterfalls and sun shelves in your pool. The colors range from purple, blue, red, green and aqua. You can also get ones that do different light shows. 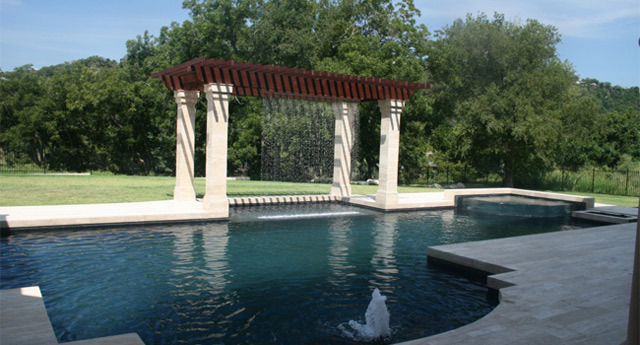 These water streams can shoot across your pool in different colors, creating a beautiful rainbow of elegance. Also, the sound of the water streams make for great, peaceful ambient noise. 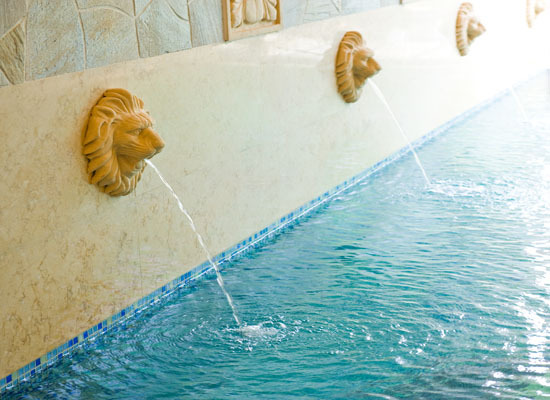 These decorative pieces can adorn your pool, sauna or pool area, really adding some character to your home. 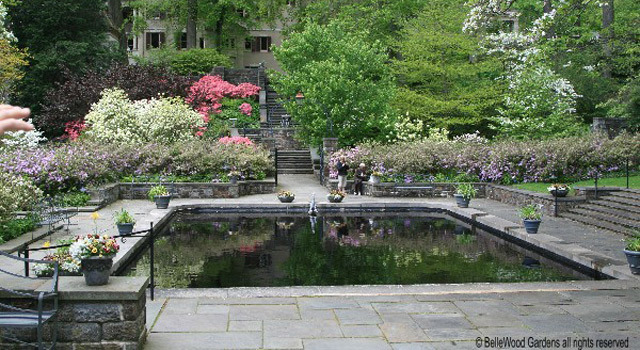 Ambient or reflecting ponds are so nice and peaceful, adding a bit of serenity to your landscaped area. Small streams of water rain down from an elevated area in your pool to create an awesome curtain of water, like a ledge outside your house on a rainy afternoon. 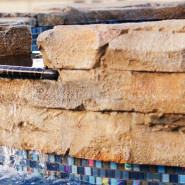 These pool deck features are quite popular, as they can add both aesthetic beauty, as well as serving as a cascading waterfalls in some planters. It seems counterintuitive to have a water feature called a “fire pit,” but this is actually a great deck feature. 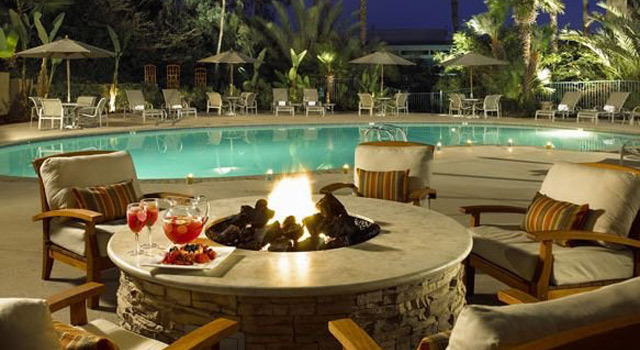 Have your friends and family sit around the fire pit on a cool evening during the cold months, while your kids play in the pool in the hot summer months. These features let water run over them, like on a small ledge, before finally falling down into the pool or another waterfall area. These are sun shelves that sit inside your pool, allowing people to sit in the deeper end of the pool and stay submerged up to your chest. 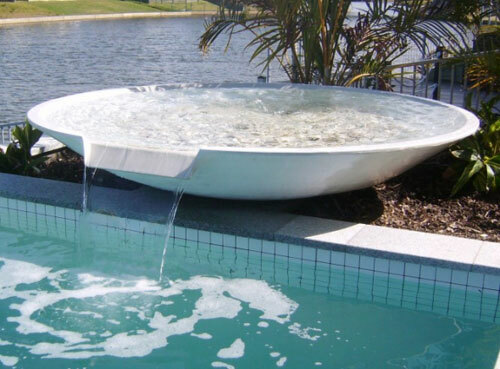 We hope some of these cool water features help give you great ideas for your own pool, spa or patio. 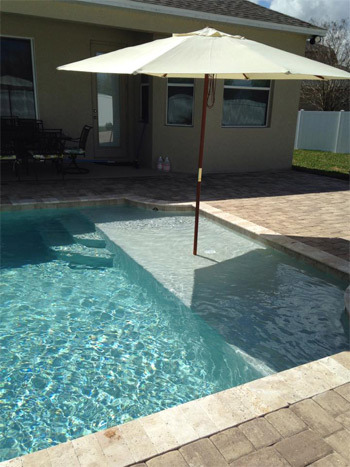 Let us know if there are some you’re interested in installing in your Central Florida pools! My pool needs resurfaced and pool deck needs replaced. Also interested in adding a waterfall. We’re in the process of having a swimming pool installed at our home, and I would love to be able to add some sort of waterfalls to our pool. I think that swimming pool waterfalls just add so much to the whole landscape scene like you talked about with the peaceful sound. 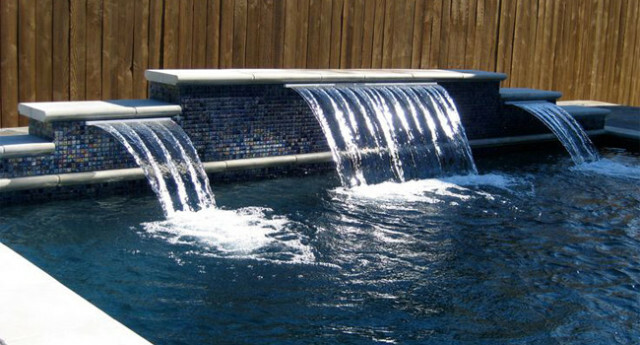 I know that my wife would really like to add swimming pool waterfalls to our design too, so maybe I’ll just talk to our contractor and see what my options are, and surprise her with one!